Maybe the NEVERCREW is short for “never sleeping”. Or at least it looks that way for the two Swiss artists Pablo and Christian that make up the NEVERCREW. With their current productivity, sleep may seem to be secondary for them at the moment. For their latest adventure the guys were out in Gisborne, New Zealand. The context of their visit was to participate in the SEAWALLS Tairāwhiti project, which is part of the PangeaSeed Foundation’s SEAWALL’s series. The title of their mural was “Disposing machine n°2”. For this work they wanted to create a proportion between an overall point of view and the focus on the perception of oceans health. Using the iconic whale figure that they know and love, the whale is one of the endangered sea mammals chosen as a “litmus test” of the situation. The Montana BLACK and Montana GOLD cans again complimented the bucket paint honorably. As did their choice of positioning on the wall they were assigned. The result is a clever classic NEVERCREW image that is bound to impress and raise a few thoughts from onlookers. Systems are human interpretations of reality and are often shaped on human perception and unique point of view. But reality, as well as systems, has its own structure and it’s a balance between all the existing elements, a balance that can be followed and supported, or that could be changed and sometimes destroyed. Human habits and politics are modifying the natural balance, sometimes in direct and visible ways, sometimes in more underhanded and indirect ways, and sea mammals are powerlessly suffering this imposition that’s embodied in increasing of temperatures, water pollution, interferences in the habitat, swings in the ecosystems, hunting, and more. A vision of this phenomenon, a perception of the overall issue and actual and future damage, seems hard to experience in a tangible way and this has to pass again from human interpretation and understanding. There’s a urge then to acknowledge that humankind is part of a balance together with the rest of the elements that compose Planet Earth, to reach a perception of a global issue that’s generated by the combination of different factors; there’s the need to exit the actual unique and artificial shape and perception that humankind gave to its systems because it doesn’t fit with reality and detach from it while corroding it. This mural has been realized for PangeSeed Foundation, a non-profit organization whose mission is to create meaningful environmental change and raise awareness about ocean conservation and, in general, about the actual environmental crisis. 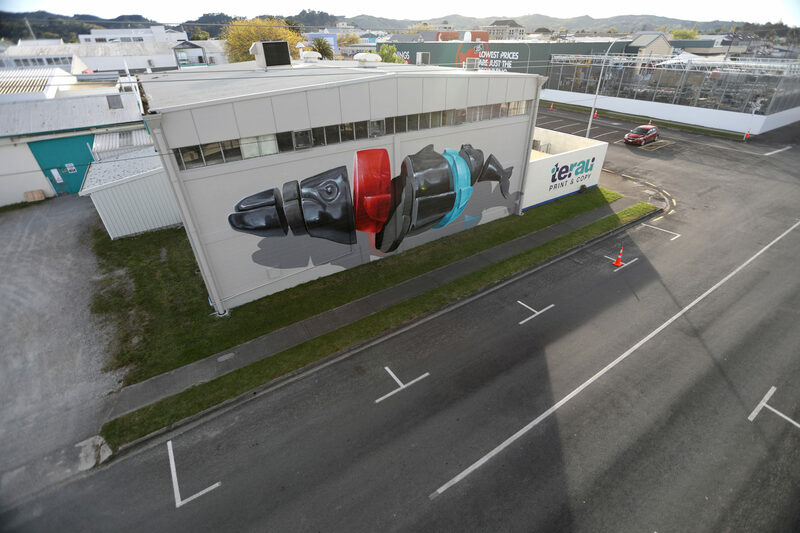 Mural painting realized in Gisborne (New Zealand) for the Seawalls Tairāwhiti project by PangeaSeed Foundation, 2018.